Olive Us is proud to offer the highest quality traditional style condimento balsamic vinegar produced by the world’s oldest and most respected balsamic maker in Modena, Italy. A “must” is created as Trebbiano and Lambrusco grapes are crushed and cooked in copper kettles over an open wood fire in the “Traditional Style”. This time honored method of making balsamic naturally thickens and deeply caramelizes the grape sugar which turns a rich, dark mahogany-brown. According to the Solera method, the cooked “must” is then placed in a succession of very old, fired wood barrels (i.e. – chestnut, oak, cherry, mulberry, ash) each of which contain residual amounts of older balsamic. The wine “must” ferments and ages up to 18 years, continuing to gain complexity and richness as it transforms into thick, creamy and incredibly sweet vinegar. Our white balsamic vinegar is produced using the same type of grapes and method as the dark balsamic, except the grape “must” is gently cooked to avoid caramelization and preserve its clear colour and then aged in new wood only. 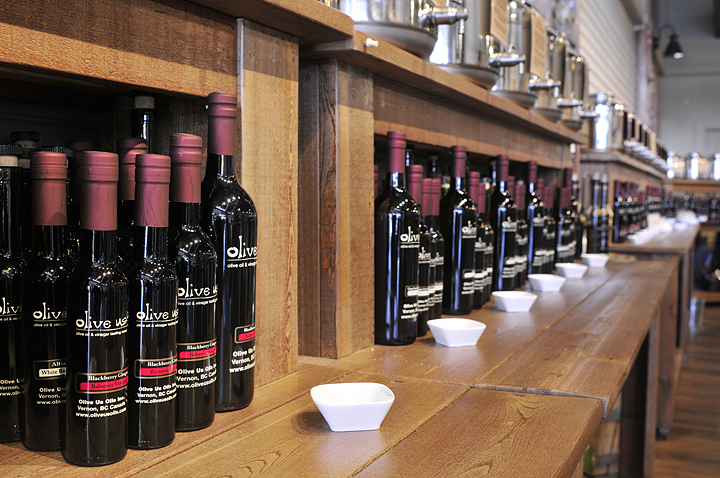 Olive Us offers a selection of fine specialty vinegars to expand your culinary horizons. Rich and sweet Natural Black Cherry concentrate and other natural flavourings are combined with aged Balsamic Vinegar to produce a sweet, fragrant and very rich tasting product that has garnered rave reviews from our gourmet customers. Enjoy on salads that feature cheeses like feta or blue, or over orange and onion Sicilian salad. Enjoy the freshness of Black Cherry Balsamic paired with Lemon Olive Oil or the spicy sweetness of Black Cherry mixed with Harissa Olive Oil. Our naturally flavoured balsamic condimento is aged in the traditional Solera Method and comes from Modena, Italy. And as always…..All natural, No added sugar, No thickeners, No caramel colour or dyes, No artificial flavours or additional ingredients whatsoever! Balsamic vinegar is naturally flavoured with floral, sweet, black currant in this rich, unique balsamic condimento. 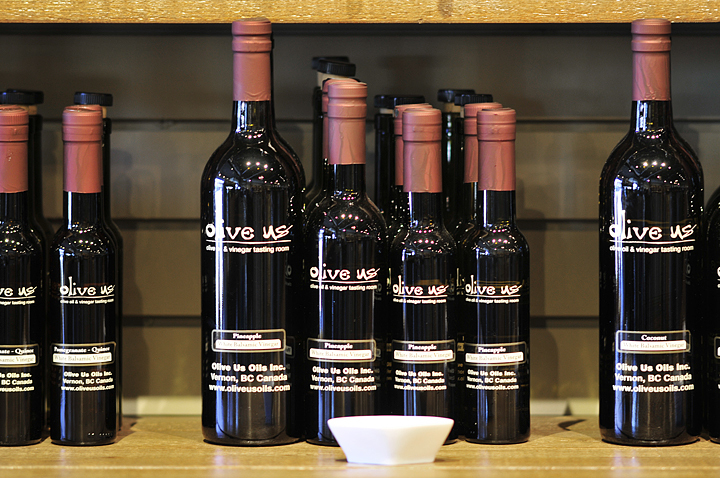 Our naturally flavoured balsamic vinegar is aged in the traditional Solera Method. A delicious pairing with Lemon or Persian Lime Olive Oil. Our Blackberry-Ginger Balsamic is wonderfully sweet, pleasingly tart and redolent with the clean, natural flavour of ginger. It makes a fantastic dressing or marinade and is divine paired with our Persian Lime Olive Oil or kick things up with our Red Cayenne Chili Fused Olive Oil. 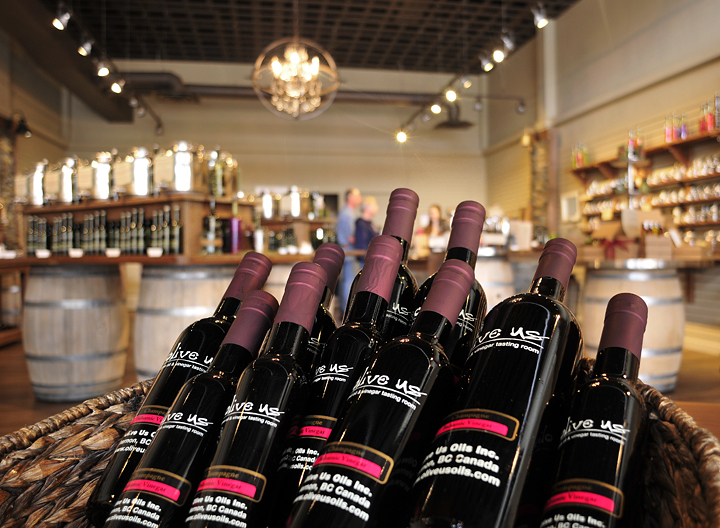 This balsamic is progressively aged in wood barrels according to the Solera Method. Our luscious blueberry balsamic vinegar is just as amazing over garden salad as it is over fruit salad. When paired with delicate extra virgin oil such as Arbequina, the intense blueberry flavor will shine. Also fantastic with our Orange or Lemon Olive Oils. Pairs well with blue and feta cheeses. Our naturally flavoured balsamic condimento is aged in the traditional Solera Method. Our champagne-dark balsamic vinegar is complex and rich. It owes its depth of flavour to Solera aged dark balsamic vinegar from Modena which is blended with sparkling white French Champagne vinegar. With an acidity of 6%, it adds a delightfully tart kick to many applications such as vinaigrettes, marinades and sauces. This delightful vinegar is spicy and warm, perfect drizzled over fresh fruit or as a dessert topping. It has the unique taste of d’anjou pear, and matches well with many of our sweeter, fruity oils for a delicious marinade or salad dressing. Amazing with Blood Orange Fused Olive Oil or Lemon Fused Olive Oil. Our naturally flavoured balsamic condimento is aged in the traditional Solera Method. This dark chocolate Balsamic Vinegar is rich, thick and resounds with the complexity of three different chocolates responsible for the depth of its’ flavour. Drizzle over vanilla gelato, mix with fresh berries or add zing to your chicken mole sauce. Our naturally flavoured balsamic is aged in the traditional Solera Method and comes from Modena, Italy. Kick it up with Dark Chocolate and Chipotle Olive Oil or create the exotic by combining Dark Chocolate with Coconut White Balsamic & Roasted Almond Oil. Of course it goes great with Blood Orange Olive Oil! This aged Balsamic Vinegar is amazingly complex, with layers of authentic espresso and dark roasted coffee. It makes a fantastic glaze or bar-b-que base for pork, beef or chicken. Add a shot to an “affogatto float”, which calls for a tall mug of vanilla gelato scoops covered with coffee. Our naturally flavoured balsamic is aged in the traditional Solera Method and comes from Modena, Italy. Try combining equal parts of Espresso Balsamic with Garlic Olive Oil and Cinnamon Pear Dark Balsamic. Always a favourite with Blood Orange Olive Oil. Made with natural ingredients, our aged fig balsamic vinegar from Modena is thick and ripe, bursting with fig flavour. Our most popular seller. Pairs nicely with Wild Mushroom & Sage Olive Oil or Garlic Olive Oil Our naturally flavoured balsamic condimento is aged in the traditional Solera Method.